To make Halloween costumes with your own hands is always fun and interesting. But the main advantage of a homemade costume is that this more accurately, no one will. Owl is a unique, striking and memorable bird, if you chose this way, so suit for him also should be special. As a rule, mottled owl, white-gray-brown. The most important element is a luxurious wings and round, expressive eyes. For the wings you can take any black, white, gray, or brown Bolero. On top of him gently tab the patches of the respective colors, to get a layered, voluminous, fluffy wings. This process is labour intensive, but you hit all at the approaching masquerade. Ate Bolero not, then sew the basis for the wings alone. To do this, cut the fabric into a large circle, the radius of which is slightly greater than the length of your hand from the neck to the fingertips. In this circle exactly in the center cut out another small circle which will fit your head. A self-made Bolero, which we also sheathed in gray, white, black and brown scraps of fabric. Looks very impressive when the basis of the costume owls are common, coarse sacks of potatoes. Of them sew Bolero and skirt, and the top tab is also different scraps, but not only fabric, but also the rustling of the garbage bags in black. 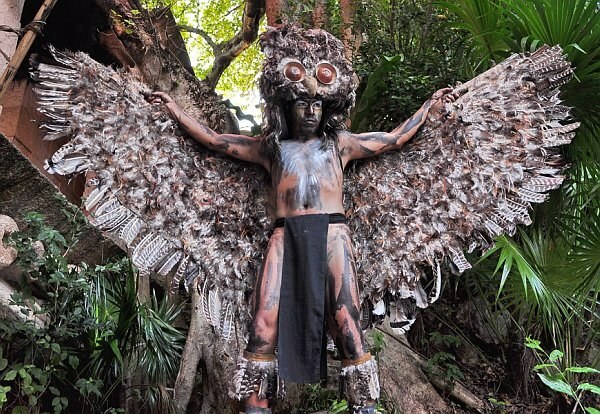 Then the costume is even more expressive, due to the fact that it makes rustling sounds when you "wing-beat". In both cases, under the wings should wear a turtleneck and tights in the colors that are present on the scraps of fabric, sewn onto the Bolero. Now for the headdress. Take an ordinary baseball cap, tab over his eyes. Eyes can be made from bottom of plastic bottles, by painting it yellow nail Polish or acrylic paint with a glossy effect, in the center of a black color to draw a pupil. Such eyes can be sewn to the cap, using the largest needle. Also, eyes can be made from bright yellow fabric, again, not forgetting the black pupil. The eyes of owls needs to be very visible and expressive. Then the cap sewn ears, which inside filled with sintipon, or any other gasket, because the ears must be standing. After all this zadekorirovat hat scraps of fabric as well as Bolero. Instead of caps to wear big round sunglasses – they are the eyes. And on her head a hat with ears, decorated with scraps of fabric. If you are in the house there's an old feather pillow, it will be very useful, carefully gut it and decorate the costume with real feathers that you can attach to the fabric with glue.